We are aware that at the recent launch, Apple has rolled out dual SIM to its iPhone through iPhone XS and iPhone XS Max models. The dual SIM capability is offered through a nano-SIM and digital eSIM with these latest iPhones. 4G telecom operator said that it is the only service provider in the country to offer eSIM activation for prepaid users. "Jio will exclusively enable the advanced eSIM feature on Apple’s latest iPhones for both Jio prepaid and postpaid users. 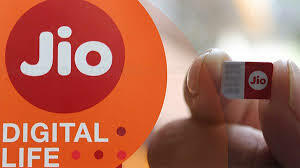 Currently Jio is the only service provider in the country to offer eSIM activation for prepaid users," Jio said in a statement on Friday. Both Jio and Bharti Airtel are Apple's official eSIM telco partners for latest iPhones - iPhone XS and iPhone XS Max. Apple, for the first time ever, introduced dual SIM to its iPhone through iPhone XS and iPhone XS Max models. The dual SIM capability is offered through a nano-SIM and digital eSIM with these latest iPhones. In India, Jio and Airtel came up with eSIM activation plans for Apple Watch Series 3 last year.